Fast, by Jorie Graham. Ecco, 96 pp., $25.99. What shoreline there is is a shoreline of microbeads, plastic straws. Overfarmed, the interior grows unworkable, the good topsoil eroded to the sea. In the gulf, algae thrives on runoff fertilizers, then dies en masse. Dead zones result. No fish, forms of sea life. Elsewhere there are other things dying, other victims of the overkill. We enter a sixth Great Extinction the way day enters fog—uncanny, the breaking of it untraceable. all in the diffidence that faltered. to lead back to splendor. In your view, there is an interrelationship between very low interest rates, quantitative easing, the way that the oil markets work, and there’s no way of breaking this relationship without some crash that would make the 2008 crash look like a relatively minor event? I mean, how dystopian do we want to go with this? … I take you to be saying we’re both in an environment recognizable from the 1970s and some of the tensions of oil producers and geopolitics but in some ways it’s more dangerous because this world is more interconnected and it’s relying on a form of finance which is at this point in no one’s power to control. Pound, of course, was famously and even violently disposed toward the “central banker,” a kind of modern Arachne, weaving out of nothing a shroud of credit, risks, compounds, deposits, compound deposits. But the crisis of the central banker as articulated by Thompson seems to harmonize with the nature of Pound’s own self-admitted defeat. Instead of splendor and paradise, Pound’s creations and deeds have gotten him nowhere. He concludes his cantos instead by recollecting his failure. He is Quixote, at last awakened from a waking sleep of chivalric delusion. He is displaced from who he thought himself to be, self-uncentered. Worse, he recognizes that his deeds have, in fact, constituted violences, crimes, unspeakable and unredeemable sentences. The conversation between Runciman and Thompson illuminates the fundamental status of “this world,” the world of the 2008 financial crash and of the Great Recession and its ensuing cultural and economic consequences—a world so geopolitically “interconnected” that even central, creative, or responsible agencies have been radically decentered. The creators of the financial world that Thompson describes are not only disempowered vis-à-vis their creation, but essentially uncomprehending of it. The unleashing of new autonomies and agencies has dislocated the prime-mover. This situation echoes that of the titans depicted in John Keats’s Hyperion, whose deposed anguish is the aftermath of a coup-d’etat perpetrated by their own offspring. Here, Pound’s own dilemma offers cross-light: his cantos map the trajectory of the hero’s fall from grace. Moreover, like Quixote, Pound’s revelation is that the hero was never a hero at all, but a creature of fantastic, self-fabling, self-enfeebling delusion. The heroes of Wall Street, the central bankers, were never the center of anything, certainly not banking. Here, Runciman and Thompson fill in for Tireseus, revealing to Oedipus the king, the CFO, the essentially tenuous nature of his ironized position—his sinister misalignment with respect to the world he was thought to rule. Oedipus imagined himself governor and protector of a world of which he was, in reality, the poison rootstock, the destroyer. To be men not destroyers. So reads the murmured dream of the figure of irony, that essential condition of modern life. Indeed, Runciman and Thompson describe our inheritance. Life post-crash is a fundamentally disempowered life—an entangled life, life lost to itself as a consequence of its own furor for networks, association, proliferation. A life whose appetite for metaphor, conceit upon conceit, for deep, abstract (financial) speculation, has led less to ruin as much as to revelation. The truth is that the palace was always already—was never not—a ruin. Nested within the realization that that Heideggarian keyword, “always-already,” applies, here and everywhere, is a deeper realization: that what you thought or think is real in fact bears no real relation to reality itself. The Everyman is a central banker. The world is beyond us. Always always-already, and in this way peripheral, the person in the ironized position recognizes the true extent of their implication. When Oedipus learns he has killed his father and had children by his mother, he realizes that he has no control over his actions or their consequences. He recognizes that he is an expression of forces irredeemably beyond him. In such a situation, what is to be done? How do I claim responsibility? How—and what for? What have I done? These questions, which underlie the essential condition of irony preternatural to contemporary life, are questions posed by a subject irradiated by the crisis of subjectivity in transition. Subjectivity is not the same when the subject dwells in realms of Big Data and cookies and the self-confirming feeds of a post-truth world. That same world, of course, first has to flow through a Google data center, which exists—like the thick internet cables that lie beneath the ocean from seaboard to seaboard—as real, material entities in the world, with costs and consequences, and not as a digital abstraction. Nothing is abstract. Facebook reported that in 2013, its data centers used 986 million kilowatt-hours of electricity—about as much as a small African nation. No act—no one-click to buy a book off Amazon—does not leave its trace, its footprint. Like Dante, loosening beneath his feet the ashy shale of the Inferno, alerting the inhabitants to the sheer embodied fact of his presence, we cannot help but impact. In an age of hyperconnection and environmental catastrophe, subjects are helplessly bound to their own aggregate significance, significant by extension, by implication; powerless to come to grips with the extent of their own power. The subject exists in an ironized position with respect to itself. The reins of real agency hang slack, ungraspable. 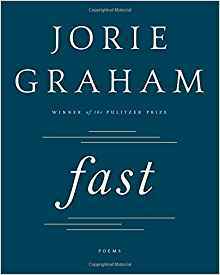 In her new collection, Fast, Jorie Graham excavates this condition, broaching the central question that lives and echoes in the heart of every contemporary subject: What have I done? Fast, like all of Graham’s work, involves the titanic effort of the trace in a networked epoch, of “teasing out the possible linkages.” This work grapples with this vast, apprehensive effort within the milieu of the Now—and the Now is never simple, never an unburdened marker of time in Graham’s poems. Fast is Now in the sense that it addresses the real dimensions of digital life, of artificial intelligence, chatbots and web forums, as well as the new forces and technologies of hyperglobalization that enmesh the individual in the fate of World and Other even as the individual, as a category, gets emulsified. Fast is also Now in the sense that it explores the metaphysics of time, especially as that metaphysics might have changed or become fundamentally altered by the developments involved in contemporary life. Graham situates her work squarely within anthropocenic discourse. How deep does human action penetrate. How far below the crust of the earth. How much of the crust is us. Ironically and massively implicated, the multiplayer anthropocenic subject exists in a state of uncertainty: Am I the world? or is the world me? where does the world begin, where do I end? From an aesthetic viewpoint, these questions indicate a radical shift in mainstream Western epistemology. Man is no longer just the microcosm of creation, as he was for Renaissance and Neoclassical thinkers. Man is now as much the macrocosm. Micro and macro both, this new status wreaks on Graham’s poems. A big-picture survey of Graham’s work—as one might find, for example, in From the New World: Poems 1976-2014—will reveal Graham’s profound commitment to exploring the concept of World and to microcosmic thinking. For that reason, Graham’s larger body of work gives an ice-core sample of the polar shifts experienced by subjectivity during the advent of the new world, when a collapse occurs between scales of thinking. Something is wrong here. There is a piercing, excruciating feedback. A fabric unraveled, perforated. The speaker registers profound disturbance, essential distraction. The “I” shifts reelingly, utterly compromised—now “you,” now world, now plankton. Graham illustrates the effect of the trace on the lyric subject: the emergent conditions of anthropocenic reality to which the speaker is exposed disaggregate and distribute the speaker’s subjectivity across all levels of what was once a “Great Chain of Being.” As soon as the word “I” appears, the speaker starts to stutter, jitter, fracture; the “I” is groundless, untenable. They try to correct for this, begging, “take plankton, take plankton”—a refrain that hinges on at least two expressive possibilities at work in the word “take.” On the one hand, Graham invokes physical possession or grasping. On the other, she uses “take” as a mode of exemplification or illustration. The speaker wants the reader to “take plankton” as a case study, as an example, as a microcosmic unit of self-expression—yet they actively contradict this desire, too. The speaker is exhausted at taking, carrying, caring. The speaker desires to simply be for a while, to catch their breath, to just “lie here / and listen.” They no longer want to work to establish “possible linkages” between self and world—yet, as of now, this work is obligatory: “I am saying / you have no choice.” This lyric subject cannot help but draw association, because the new subject is the networked subject, macrocosmically decentralized and dispersed. In this passage, the Self portrayed is impossible—that is, is always-already. It is 2015 and, in fact, nothing is possible, or able to be, or be itself. Everything, rather, has been retroactively prefigured inside of systems of such complexity that those systems have begun to dream, to think themselves, an artificial intelligence. A new intelligence on the basis of aggregation, feedback, elaborate reciprocation. What have I done? One response might be: Everything. But the new failure of Graham’s radical tracework—a tracing-back and tracing-out that she mastered in a book like Sea Change, where coherence manifests itself as an expression of will—means that there cannot be an answer to this question. There cannot be an answer because there cannot be a reckoning; there can be no accounting. It’s not that there are too many data-points; it’s not that “eternity” is “information.” Rather, there can be no objective reckoning because the new subject has been radically implicated, dispersed, and entangled in the status of the object, or the objective, itself. In the age of the anthropocene, at the depth of the internet, there is just us. I am the upwelling. I am the quick and the dead. I am the internet. I am what joins thing to thing, my “synthetic materials last forever,” look on my works, ye mighty, and despair. And yet, at the same time, in spite of the pervasiveness of human subjectivity, Fast still testifies to its essential decentralization. Its non-essence. Here is the paradox at the heart of Fast: I am everywhere and nowhere. Not only that—the fact of my being everywhere has resulted in radical laterality with respect to myself. Fifteenth-century German philosopher and theologian Nicholas of Cusa said something similar when he defined God. In “Shroud,” Graham revisits the “holy shroud” in which body of the son of God was purportedly wrapped postmortem, and which, according to legend, continues to bear the stain of his imprinted image. However, Graham here enshrouds the modern, secular subject, transposing and repurposing Christ’s shroud: “we leave a lot of stain → we are wrapped and wrapped in gossamer days → at the end what is left is a trail → of bodyfluid.” This “ooze” of ours, “soaked with ancestors,” is the “stainage of having lived,” another unintended output, another kind of detritus, a Pacific trash vortex, a granola bar wrapper from this morning, a Pepsi can in the garbage. These are the tokens of my deification, deposed titan that I am. Everywhere implicated, nowhere able to act. Defining the specific qualities of the sixteenth-century art period Mannerism, John Shearman has described some of the ways that Mannerism signaled or corresponded with changes in the sociocultural strata of the era. He notes that the category or identity of the artist had by this time acquired a new aura: a Mannerist obsession with “style,” often stressing achievements in form over content, gave rise to the cult of personality that continues to surround the person of the artist. It is around this time, for instance, during the High Renaissance and early Baroque, that collectors sought art-objects from specific artists—not for the fineness of the work, but the reputation of the name associated with it. Shearman explains that this shift in the nature of art appreciation lead to the embrace of “the divine right of artists: the right to create, invent and manipulate even willfully, not in imitation of nature but on the basis of nature already conquered in works of art” (48). There is the artist, divino. God was born a man. The human, a body sweating fluid, leaves its traces, its tracework, its network, extensible in space, everywhere and nowhere. There are several other ways in which Graham’s poetry might be classified as Mannerist or neo-Mannerist, developing on certain Manneristic tendencies or paradigms. I will elaborate on a handful, because I believe that by revisiting Mannerism and the art of the long sixteenth-century (as Graham often does in her poetry), a reader can better understand how Fast provides an aesthetic solution to the difficult evolutions of subjective agency in the anthropocene—an era whose widespread trauma is felt not only by organisms of the natural world, but by the abstract entity of the subject, in both its political and metaphysical incarnations. the experience of the creation of the work is the only space possible for the artist, who in this way circumscribes the awareness of his own minority, the historical inability of art to face up to the world, within the refuge and enclosure of language, within its articulated manners, the only ones able to give the shattered individual the adhesive of a precarious omnipotence. Those familiar with Jorie Graham’s work will already sense similarities between Oliva’s gloss of mannerism and neo-Mannerism and Graham’s own development as a poet over the course of the last forty years. Fast only further crystalizes, then expands upon, this congruence. What other contemporary poet has so unremittingly concentrated on the question and consequences of “creative omnipotence”? The fear for Graham has always oscillated—a “relentless nomad”—on a circuit between two close-set poles: on one hand, her poetry harps on the fear that the gap between the real and the experience of the real cannot be bridged; on the other, she worries that the bridging of that gap—what we are doing all the time, especially in art—only enforces a greater distance and abstraction. In either case, like Oliva’s neo-Mannerist, Graham also shares the sense that “the experience of the creation of the work is the only space possible for the artist.” Now, in ways that have not found full expression in her other books, Graham uses Fast, lashed as it is by and to a “new world,” to do what Mannerists do: in a historical situation defined by contradiction and alienation, the Mannerist does all they can to circumscribe the awareness of their own minority and confront the historical inability of art to face up to the world in order to give the shattered individual the adhesive of precarious omnipotence. Still more terrible the situation. I do not want the 3D glasses, friend, it’s already 3D. Look up look out. Out—what is that. Will you come out? Can you? Why don’t you try. others? Those are people. People made from a file. Someone printed them. It’s additive. The present is thus the other dimension, the dimension where the subject does not exercise his own heroic possibility, i.e. that of beseiging himself, but only the dimension in which living coincides with self-assertion, and self-assertion with negating the possibility of one’s own negation. Asserting the “I” by negating the possibility of the “I’s” own negation, Graham’s speaker insists that being-there is a leaving-behind. The result is an unalienable self-alienation: I am not what I asked for. Word superseding word, cell superceding cell, we are indeed “in a systemacide,” as Graham writes, describing the cancerous irony in which the modern subject has been incarcerated—as if within one of Piranesi’s Mannerist Carceri, one of his imaginary, or invented, prisons. Some might find it irresponsible to draw critical congruence between Graham and Achille Bonita Oliva’s admittedly idiosyncratic and hypertheoretical text on Mannerism. Let me offer a deeper—though perhaps also more tenuous—link. For all its discursive modulations and glosses on the global, an important aspect of Graham’s book that I have so far neglected to mention is its elegaic quality. Even in the contexts of the torsions of the new world, Graham reflects on the death of both her parents, as well as on her own experiences with cancer. Poems like “The Post Human,” “From Inside the MRI,” “The Mask Now,” and “Mother’s Hands Drawing Me,” confront what it means to be dying—or rather, what it means to know you are dying. That is, what is to be done after one possesses the knowledge of one’s death? Graham, of course, applies this question to planetary, as well as personal, contexts. Much of Fast reflects on the experience of living in the aftermath of knowing. This, of course, is consistent with the ironized position in which Graham’s subject discovers herself: after catastrophe, the ironic subject lives on in the full knowledge of their reversal of fortune. Oedipus, of course, enacts and fully embodies this in Oedipus at Colonus. In a condition of irony, the Now is after. According to Shearman, a more traditional art scholar than Oliva, Mannerism constituted an art movement characterized by its condition as an afterword—a gloss on the achievements of the High Renaissance. Mannerists employed sinuousness, laterality, exaggeration, and, above all, style, as a way of indicating “self-awareness in the creative process,” which Shearman explains was an outgrowth of a historical pose struck in response to the Renaissance. Shearman points out that the reproduction of the aesthetic achievements of the past, developing during this age of copies and prints, became an expression of virtuosity and an opportunity for variation and stylish transposition in itself. In this way, the deep referentiality at the heart of Mannerism facilitated Mannerist obsession with artifice and formalism. Giancarlo Maiorino puts this another way: Mannerism acknowledges the perfection of antiquity and the Renaissance and, in response, tries to invoke something in excess of perfection, something more perfect. In so doing, Mannerism creates an excess that undermines sufficiency. The triangulation provided by Shearman, Maiorino, and Oliva helps establish that the Mannerist adopts their artificial or stylized and self-aware posture as a consequence of historical and existential laterality. Graham, of course, has used Mannerist art for ekphrastic or explanatory purposes; in Erosion, for instance, Graham reflects on Luca Signorelli’s Resurrection of the Body, an example of High Renaissance or Mannerist art. However, more often and more significantly Graham makes reference to Renaissance art and artists like Piero della Francesca or Massacio, thereby quite literally situating herself, consistent with Mannerism,“after” the Renaissance. On the one hand, the imagination surpasses life; on the other it can never totalize life and possess it completely. This impossibility also reduces the possibility of censoring writing that can only establish tautology, language that can only speak itself. On the other hand, language assumes an appearance that is in some respects reassuring. Indeed, language possesses the omnipotence to encompass all the contradictions; a poor kind of omnipotence, all in all, because it is entirely superstructural and formal, but omnipotence nevertheless….This is the privileged moment of Manneristic sublimation, when the rules are changed halfway through the game and everything finally appears to hang together. In light of this insight by Oliva, I reassert my characterization of Graham as a neo-Mannerist, since the resolution she offers in the final image of her book is an answer to the problem of deferment, supersedence, acceleration, dispersal, dissolution, excess and overwhelming implication—that is, that mind, language, and the imaginary lend a kind of powerless power. Thought, like language, establishes the limit, the real, by transgressing it, or “betraying” it. The splendor of language is that it endlessly and needlessly and scribblingly proliferates. It contains and subverts in order to be surpassed. To do is to fail. To fail is to see. Here is a gloss of the story of Oedipus the King. Here, too, is a gloss of the final lines of Fast, where the forms of the visible depend on the “non-being” they are rendered by being-rendered. Moreover and lastly, here is a gloss of the Manneristic sublimation, when everything finally appears to hang together on the basis of contradiction, the contradiction that powerlessness is power. Omnipotence, even. The neo-Mannerism of Graham’s Fast performs an act of salvage. Fast suggests that the agent is a failure, a traitor: the actor is acted-upon; to inflict is to self-inflict. To live now is to live lateral, lateral to the now—suspended, deferred, undying, untimely, a growth possibility, an excess that undermines sufficiency. Recall Runciman and Thompson at this point: power is known now everywhere as powerlessness. But to dwell in the contradictions and self-awareness of powerlessness may yet offer a kind of hope, a kind of hoping against hope. These are the words, of course, that the apostle Paul used to describe faith to early Christians—the “hope against hope” that the end would come, that the Messiah would return. But, until then, the Pauline Christian is tasked with living in a state of radical insecurity, having to persist in faith, guarding against the self and its selfishness, its lawlessness, the traitor into which one can be transfigured at any moment. Observe the apostle Peter, his head in his hands, that posture of irony; the obverse of Pauline hope is despair and failure and abyssal powerlessness. Yet, it is only out of abyss, opacity, non-being, unmaking that form takes shape, by its principle of “attritive progress”—words that William Faulkner once used to describe the emergence of wisteria into light, as light. For the dark as it leaves is light. What-is takes form out of what-is-not, a dark matter, and there is more of dark matter than of matter itself. Indeed, there is still more, and what’s more, there is still time. Kylan Rice has an MFA from Colorado State University, and he is working on his PhD at the University of North Carolina at Chapel Hill. Some of his poems can be found at Kenyon Review, The Seattle Review, and elsewhere. His book reviews have been published by Colorado Review, West Branch, Carolina Quarterly and the Emily Dickinson Society Bulletin.